The East Bay’s most traditional ice cream maker is now churning one of its most untraditional flavors: molé. 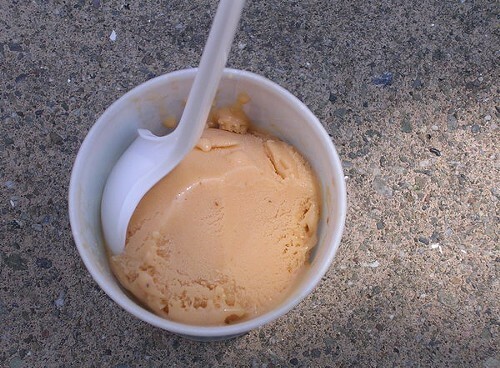 Back in 2007, the Express discovered Fruitvale frozen dessert maker Luis Abundis, still the only guy in the Bay Area we know who’s turning out nieves de garrafa, ices made the way they were before the rise of the crank freezer, which is to say completely by hand. Abundis has a smile only slightly less impressive than his upper-body strength. Standing at his garrafa — a metal canister wedged inside a wooden bucket filled with ice and salt — he turns out multiple batches of ices every day, beating house-made mixes with a hand-held paddle till they freeze. Turns out we weren’t Abundis’ only fan. For a couple of years now, Lito Saldaña — chef and owner of Cocina Poblana — has been sourcing vanilla ice cream from Cinco de Mayo, offering it at both his Jack London Square and Emeryville restaurants with a house-made churro, cajeta, and a Mexican chocolate reduction. Saldaña and Abundis have a connection that runs deeper that mutual admiration — both men grew up in the same region of Jalisco, outside Guadalajara, though in separate towns. So when Saldaña sat down to devise the expanded dessert menu he’ll launch next week, his first idea? Appeal to Abundis to provide an expanded range of flavors, including one tailored specifically for Cocina Poblana. “Since we specialize in molés, we thought it would be nice to see what he could do,” Saldaña told What the Fork. He gave Abundis batches of the restaurant’s three red molés. Abundis ended up blending them for the ice cream he eventually came up with, a pale, orangey-peach confection made with milk but — like all of Abundis’ ices — no egg. The flavor’s gentler than you’d think: There’s warmth from the spices, chile that registers more as sweetness than heat, and just a flicker of onion and garlic — it all works, thanks to the naturally stripped-down texture of Abundis’ ice milks, and his tendency not to oversweeten. Saldaña said the molé ice cream (paired with fried sweet potato chips) officially launches next week at both Cocina Poblana locations (1320 65th St., Emeryville, 499 Embarcadero West, Oakland). And Abundis is already selling scoops at Nieves Cinco de Mayo, the original in the Fruitvale Public Market (3340 E. 12th St.) and the offshoot at 3448 International Blvd. Comments? Tips? Stay in touch via John.Birdsall@EastBayExpress.com.